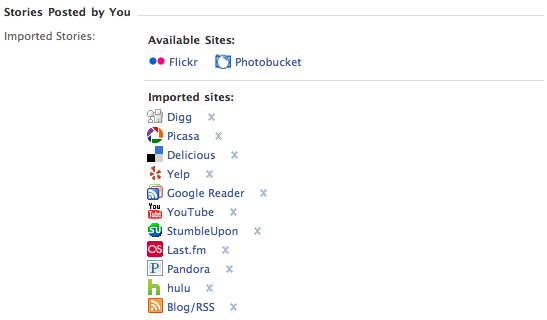 How do I get my content from other services, like Google Reader, Picasa, Delicious, etc. into Facebook? Of course, there are a million apps for Facebook, and using them you can probably hack together a solution to get all your non-facebook content into your stream. But that’s a manual process, which is “meh” at best. Turns out, there’s a Facebook-native way of doing it. Just go to your Facebook homepage, click on your Profile tab, and then on Settings under the Share button, as seen in the image below.